There are times when my friends seem to know exactly what I’m thinking. It’s a little eerie. It is a recent midday, and I’m in a bit of a funk. Zany’s former office, which was also once Mad Me-Shell’s former office, is gathering dust. The other day I found an old hamburger wrapper balled up in the corner of the office, once the hub of a massive lunch operation. It reminded me of those grand days when food trucks roamed wild across Manhattan. Now, thanks to a judge who is clearly dyspeptic, the food trucks have mostly fled midtown and I’ve eaten a turkey sub with honey mustard for lunch for exactly 21 days in a row. Were you aware of this? It’s grilled cheese, TW! You can’t go wrong with grilled cheese! And as if that weren’t enough, they have tater tots…with dipping sauces. You know, to make them gourmet. Run, don’t walk, and go find that truck! I’ve never met anyone like Mad. She has this razor sharp culinary radar that never dims, even when she’s got a couple of Pabst Blue Ribbons under her belt. I take a minute to contemplate the irony of my Chicago friends tracking down New York lunch recommendations for me. Then I get a little misty eyed, realizing that someone out there still cares. Then, I click on Instant Message and summon Marie Antoinette on an urgent mission. She needs no convincing. 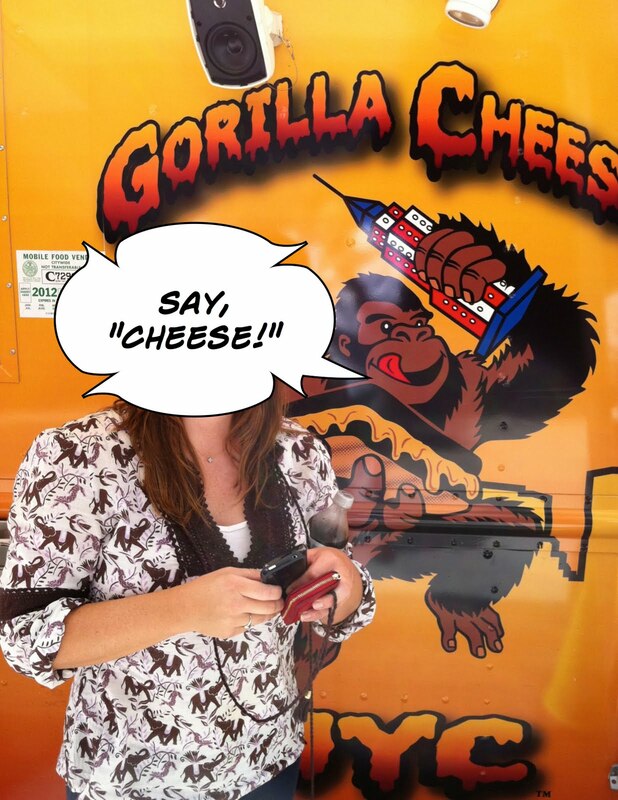 “You had me with the words “Gorilla Cheese,” she replies, and we are on our way. We check our sources and find that the Gorilla Cheese truck has been frolicking in a couple of nearby neighborhoods, and we get a line on the truck’s location over on Park Avenue. It’s a bit of a walk, but as Marie Antoinette notes, with grilled cheese and tater tots on the menu, the extra exercise is a plus. I haven’t seen MA in a while. She’s been off attending some kind of summer camp in Canada. She’s a bit mooney-eyed over the prospect of grilled cheese for lunch. “I think they should make grilled cheese one of the major food groups,” she says. I make a note to pass that suggestion along to the FDA. We are heading across town at decent trot. I spot a yellow vehicle in the distance and my heart starts pounding with anticipation. Yet, as we get closer I am crushed to find that it is nothing more than a DHL delivery truck. Marie Antoinette looks at me sideways. “Easy, Tiger,” she cautions. Then we spot the Gorilla Cheese truck just ahead – it’s a bright banana yellow emblazoned with a cartoon of its simian mascot, who is sort of a cross between King Kong and Curious George. We have to wait our turn behind a group of young bankers, dressed summer casual in khakis and button-downs. Gorilla Cheese promises "Awesome Grilled Cheese" and offers a variety of classic grilled cheese menu items along with specialty sandwiches and sides, like tater tots and mac and cheese. I’m thinking hard about the mac and cheese but MA refuses. “I’m sticking with the classic grilled cheese,” she insists. The truck’s motto is “It’s Easy Being Cheesy,” and we fall right into line with that philosophy. Marie Antoinette orders a grilled American cheese on whole wheat, with tater tots and ketchup on the side. I send Mad an instant photo of Marie Antoinette posing with the friendly gorilla. At exactly the same moment, Mad sends me a photo she’s harvested from Yelp which shows someone demonstrating the cheesy elasticity of Gorilla Cheese. It’s titled “Your Inspiration Today.” How does she know we are eating grilled cheese at that very moment? The woman is a redneck culinary psychic. I decide to get a little creative. While I certainly advocate the classics, there’s always room for alternatives. I order a grilled Gruyere cheese on multigrain bread, and along with my tater tots, I ask for ginger dipping sauce. Yes, I’m an iconoclast and a gourmand. We head to a nearby plaza for an impromptu picnic. The Gruyere grilled cheese is hot, nutty, and kind of stringy – everything a fine grilled cheese sandwich should offer. The “classic” American grilled cheese gleams bright orange in the afternoon sun. It’s less pliable, but the essence of cheesy comfort oozes out of the bread. The golden tater tots are so petite, they’re actually infants and they’ve got a nice crisp bite. I alternate between the ginger dipping sauce and ketchup. It’s a tough call. Time’s a wasting, and we realize that we’ve been AWOL from the office for some time. We power walk back to HQ, and are both a bit winded. “We probably burned off exactly ONE tater tot with that walk,” notes Marie Antoinette. I don’t know about that, but later that afternoon, I do have a sudden urge to climb the Empire State Building. Yep, grilled cheese should definitely be one of the major food groups. It would make kids of all ages happy. Grilled Gruyere and multi-grain bread sounds very gourmet and classy TW. Definitely worth the trot to find the cheese truck. You sure have a good time up there in the city. What a delicious, spontaneous adventure! The ginger dipping sauce sounds delightful. TW, you would be proud. I've persuaded my new co-workers to go on a food truck adventure - I even officially scheduled a field trip! So what did I prepare for "dinner" tonight? A grilled cheese and bacon sandwich and to boot, I devoured it as I read this post! Now, that's "eerie." It's so nice to "hear" the spark in your voice when you mention food trucks, T.W., especially when Grilled Cheese is on the menu! BTW, your post made the front page of my online newspaper; The Edible Celebrations Daily. I'm as big a fan of the old fashioned grilled cheese as there is, but really would have chosen the gruyere too. And without looking at your photos. But once I saw those, no question...gruyere. Good for Mad. She's got your best interests in mind all the time! Loved it! Nothing like a great grilled cheese with tater tots!! Wish we had some food trucks in our little town. i wonder what the milk truck guy would think if he caught you two-timing with these monkey people? Love grilled cheese--with any kind of cheese! I'd have went with the grilled Gruyere cheese on multigrain bread too. Don't know about the tater tots--even with dipping sauce. What a great idea for a food truck! Sigh.... Reading this has left me with a hankering for a food truck lunch. Alas, there are none in the 'hood today, so I'm left salivating over these pictures!!! The injustice of it all! I just read that a schnitzel truck AND a meatloaf truck are getting ready to launch here in the windy city, so fear not, updates are soon to follow. Mobile meatloaf...it's like my dream come true!! Mad - if you get a mobile meatloaf truck, you'd better open up your guest room for me. Or, I'll have to move in with Zany and Luigi. Joumana - in my defense, desperate times inspire desperate cravings. I did enjoy tater tots as a kid, but hadn't had them in years. Try thinking of them as petite French fries and maybe the idea will be more appealing!